The dowel stick brings the neck and the rim together. I use a wooden dowel, as many open back banjo makers do. It is possible to use a steel rod or a pair of steel rods for the dowel. Steel rods are not a bad solution. There may be some tonal variation associated with the use of different materials for the dowel. I prefer to use wood. You may be able to cut this piece out of the leftovers from the neck blank. The dowel stick begins at 1″ x 1″ square and should be about 2″ longer than the outside diameter of the rim to begin with. 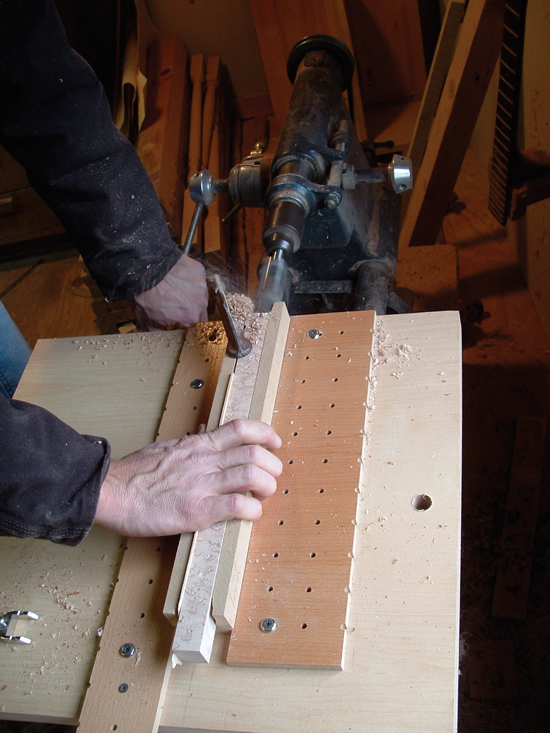 Then it is cut 3/4″ round at one end using a tenon cutter and a holding jig. The round end fits into the neck’s dowel stick hole. Take a look down the length of the neck with the dowel stick in place. Does the stick point off in one direction or the other, is it straight with the neck? If the stick is off-center, try turning it 1/4 turn. If that doesn’t fix it turn it again. Find some way to mark the dowel so that you will know which way it goes when you want to put it back in later. At right; the tenon cutter used to cut round part of the dowel stick. 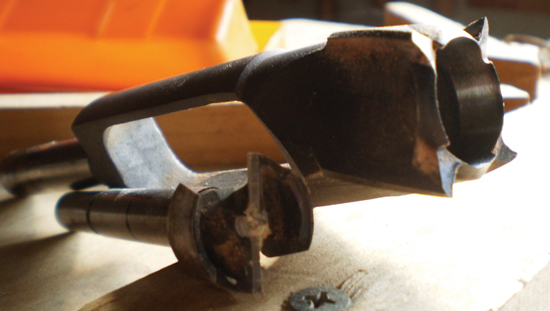 At left: the Forester bit used to cut the dowel stick hole in the heel of the neck. Using the jig to hold the dowel in place while the tenon is being cut. After the stick is test fit to the neck, its thickness is trimmed down to 3/4″ x 1″ to allow the neck brace to slip around it. The 3/4″ sides will face the front and back of the banjo. The dowel stick facilitates the use of a neck brace, which helps to hold the heel of the neck tight against the rim. The use of a neck brace requires a small hole for the brace pin that is usually located a little less than 1/2″ from the inside surface of the rim. It is best to wait for this step until you have the neck brace, then measure and adjust accordingly. The end pin screw secures the dowel at the other end. The hole that the endpin screw goes into will have to be pre-drilled along the length of the dowel stick, it should be as close to the center of the dowel as possible. Take care to make the hole big enough for the end pin screw, otherwise there is a risk of cracking the dowel. The dowel stick may be tapered on all four sides at the end pin end of the dowel. I like to wait to taper until I’m ready to fit it to the neck and rim. That way if it looks a little crooked in there or something, it can be tapered to one side or the other to create visual symmetry. This solution can be discovered on many older banjos. A clean-cut tenon on the end of a wooden banjo dowel stick.